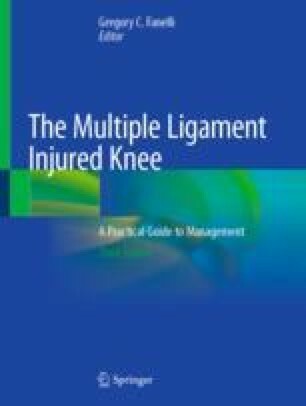 This section in The Multiple Ligament Injured Knee: A Practical Guide to Management, Third Edition, presents selected cases in treatment of the multiple ligament injured knee that are representative of my practice. I have written this chapter in first person to provide a more personal approach to presenting these topics. These selected cases represent real-life management examples in the treatment of difficult knee ligament instability problems. The format followed will be the same for each case study to provide consistency in the presentation, and is outlined as follows: history, physical examination, imaging study findings, surgical timing, graft selection, surgical technique, postoperative rehabilitation program, and results. Details of the surgical technique will not be presented in this section since the surgical technique was performed as I have described in Chaps. 1, 20, 22, and 36 in this textbook. Specific topics presented in this chapter of selected case studies include nonsurgical treatment, open growth plates, multiple ligament knee injuries in young athletes and middle-aged adults, extensor mechanism disruption, complex knee ligament instability in the obese patient, revision multiple knee ligament surgery, and peroneal nerve injury. The purpose of this case study chapter is for the reader to gain insight into management and treatment strategy decisions in these complex knee ligament injuries.